Smart Giving Matters: We're Moving! As promised, we've been hard at work this year ensuring sustainability for Charities Review Council. One option, with potential for great impact, was to reduce our operating expense by re-locating the Council office. 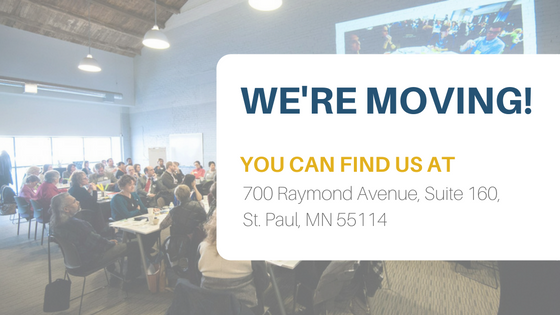 We're excited to share that we will be moving on Monday, November 21st! Our new office is just around the corner from our current location, giving us the same proximity to our donors and nonprofit partners. You can find us at 700 Raymond Avenue, Suite 160, St. Paul, MN 55114. The new space not only right-sizes us for our current programming activities and staffing model, but also allows us room to grow, as we continue to expand our reach. All of this while helping to recognize almost 40% in annual savings! Feel free to reach out (or stop by!) as we welcome any chance to talk with our partners. Additionally, please update our mailing address in your files. Our phone number and email addresses will remain the same. Smart Givers Give to the MAX!